A Strategic partnership between Prince Mohammed bin Salman (MBS) College for Cybersecurity, Artificial Intelligence and Advanced Technologies and the Stanford University of America have been signed in San Francisco, California, the Saudi Press Agency (SPA) reported. On behalf of Saud Al-Qahtani, advisor to the Royal Court and chairman of the Saudi Federation for Cyber Security, Programming and Drones (SAFCSP), Dr. Abdullah Al-Dahlawi represented the college in signing the deal, the Saudi Press Agency reported. 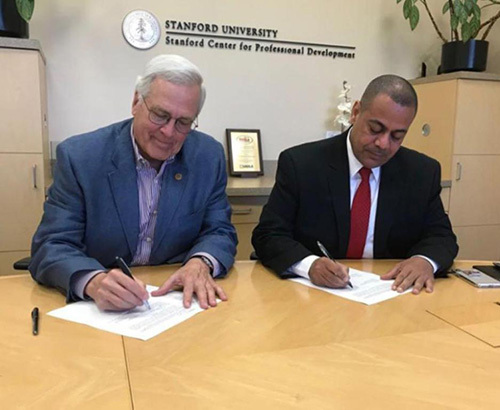 Dr. Al Dahlawi said that this strategic partnership will support the stage of the institutional building of the college according to the standards of international universities because Stanford University enjoys a global position in the fields of computer science and engineering. He added that Stanford University will contribute to the design of academic content for cybersecurity, artificial intelligence, high-performance computing and cloud computing. Khaled Al-Suwailem, a member and expert at the Global Projects Center at the College, said that the pact shows the keenness of the university to have partnership with the Prince Muhammad Bin Salman College as a specialized educational institution, which is striving for the transfer of knowledge and localization of technology keeping pace with the Kingdom’s Vision 2030. The College has already signed a number of key pacts with internationally renowned educational institutions. These include Carnegie Mellon University, Draper University, Booz Allen Hamilton, and SANS Institute. On 16 April 2018, Crown Prince Muhammad Bin Salman, Deputy Premier and Minister of Defense of the Kingdom of Saudi Arabia, approved the naming of the College of Cyber Security, Artificial Intelligence and Advanced Technologies after him. The college, which was then under formation, will be called Prince Muhammad Bin Salman College of Cyber Security, Artificial Intelligence and Advanced Technologies. The approval of the Crown Prince came in line with a proposal submitted by Saud Al-Qahtani, chairman of the Saudi Federation for Cyber Security, Programming and Drones, the Saudi Press Agency reported. Al-Qahtani thanked the Crown Prince for the approval, saying that it represents his noble gesture in extending continuous support to Saudis who are interested in this vital domain in which the world’s advanced countries are competing to build outstanding national capabilities. On his part, Acting Dean of the College Dr. Abdullah Al-Dahlawi thanked the Crown Prince for accepting the proposal to name the college after him. “The college is to be a world standard premier educational institution to train and qualify national cadets in the cyber security, artificial intelligence and advanced technologies,” he said. Stanford is known for its academic strength, wealth, proximity to Silicon Valley, and ranking as one of the world's top-ten universities.